If you're seeking to parent your child without fear or anxiety, wanting to reduce conflict, or want greater connectedness within your family, then this is the course for you! fed up and frustrated with ineffective “strategies” and outdated parenting”techniques”. "After reflecting on the values we would like to nurture in our children during our class, Melissa then asked us to make a list of all the things our children do that drive us crazy. And as we stared at that frightening list, Melissa shared something I will never forget: "In each of these upsetting behaviors is an opportunity to nurture those values." Melissa is uniquely skilled at helping parents find solutions to the many challenges of raising children while always keeping that bigger picture in mind. "This program provided me with effective tools to parent my son. My son responded almost immediately to even small changes in how I approach our interactions. I am a happier and calmer parent as a result and frequently refer back to the program materials when I need a personal "mini-refresher". Melissa has great energy and a wealth of parenting knowledge that I'm truly grateful to have tapped into." Wake up feeling ready for the day ahead because you are empowered as a parent. Have a clear vision and plan for creating a better family experience. Be kind to yourself and your child when you or your child make mistakes, knowing how mistakes can benefit you and your kids and present opportunities for learning. Understand what makes your child do and say the things they do, so even when they drive you crazy, you respond with kindness and not react out of fear or anger. Develop the skills needed so your child WANTS to cooperate. Be delighted by your child more often than not, and truly enjoy spending time together. WHAT'S INCLUDED IN THE COURSE? The Childproof Parenting course for parents of toddlers & preschoolers is a 6 week program designed to help you develop a parenting plan that builds your confidence, allows for more ease and fun at home, while inviting your child's cooperation. You will learn the tools and information needed to avoid and handle any parenting challenge. The Childproof Parenting course will include simple tools and techniques, video lessons and trainings, a workbook and worksheets, handy tips, live calls and an online community to keep you inspired and motivated. "Melissa's knowledge, style, and teaching methods were great. I really loved the "fill-in-the-blank" handouts she used. I took lots of notes and will continue to go back and review both my notes and the videos! I'm glad that we have lifetime access because I know that I will revisit the material." Getting Clear About Where YOU Get Your Energy and Where YOU Invest Your Energy? Introduction To Discipline- What It Is And What It's Not! This entire course is all you will need throughout your child's youth and beyond! Enroll in Childproof Parenting now! "The first few "groundwork" modules were every bit as valuable to our family as the discipline ones. They facilitated many meaningful discussions that helped us become a stronger team. The length and content of the modules were perfect and well presented. The style made the content easy to understand and the specific examples made it easier to see how the approaches translate to an actual situation." Feel Confident In Your Parenting Now. Even if you didn't have time to do practice every day during our Parenting Boot Camp, you still have a leg up on most parents who are caught up in the vicious cycle of trial and error parenting, reading more books and listening to endless podcasts. Here's the deal: You were able to learn and hopefully master one of the essential parenting skills in the Childproof Parent framework in the Parenting Boot Camp. Don't get me wrong. These skill are incredibly effective in helping to create a happier home and stronger relationship with your child. But one or two skills alone won't achieve your short and long term goals for your family. If you want to succeed in managing the day to day family life with ease and joy and avoid burning out, you must find balance and build a toolbox of parenting skills and strategies. Childproof Parenting is how you do that. You need specific, actionable, simple, evidence based strategies that will invite your child's cooperation and foster mutual trust and respect. You need to know how to stop wasting your time and energy on ineffective knee jerk parenting responses. By getting clear and focused, you will be able to enjoy the time you have with your child. 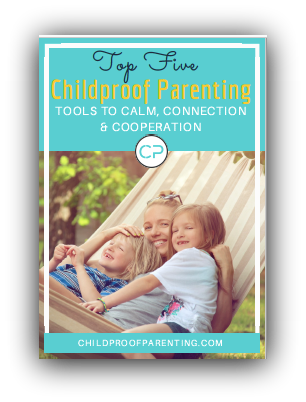 You need the Complete Childproof Parenting Roadmap. + How long does it take to do the course?? It's really up to you! The course is broken down into short video lessons on each topic, and you can watch them over time, or in a binge weekend, depending on what suits you! 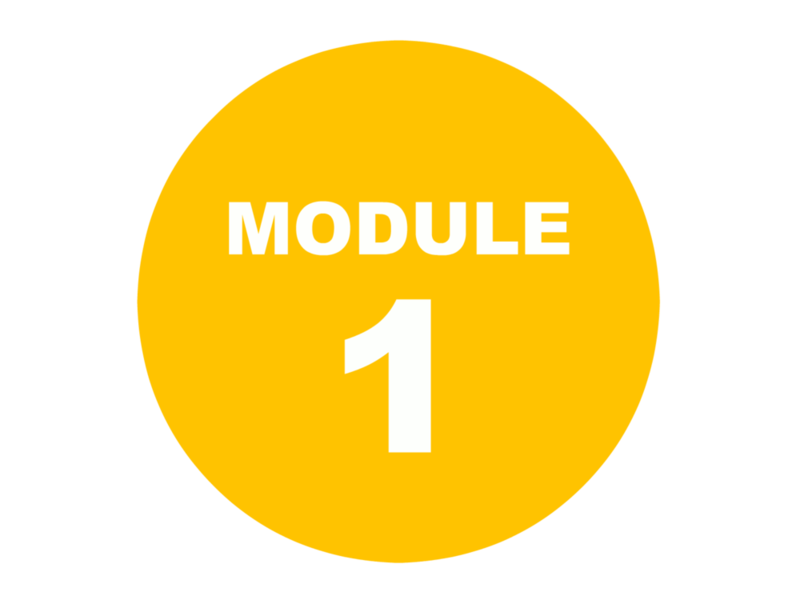 The first few modules are delivered one week at a time so you don't get ahead of yourself or overwhelmed. You can always go back and re-watch again. + When does the course start and finish? The course starts now and never ends! It is a completely self-paced online course - you decide when you start and when you finish. I will be dripping out the modules the first few weeks just so you don't get ahead of yourself or start to feel overwhelmed. The live video Q & A sessions will take place over the first six weeks. + How long do I have access to the course? + What if I am unhappy with the course? I would never want you to be unhappy! If you are unsatisfied with your purchase, contact me in the first 14 days, demonstrate that you have done the first 2 weeks worth of work and I will give you a full refund. *If you sell a similar parenting program or course, you will not be eligible for a refund. + What if the approach doesn't work for me? This course only works if you do. Just purchasing this course does not do the work for you - you have to be willing to put in the effort and time to implement the tools and strategies explained in the course. If you have 1-2 hours a week to focus on the work you can make this happen. This won’t be easy, it requires hard work and time - but it is SIMPLE once you know exactly what to do. And once you've learned these strategies, they will become your natural response and completely change your home life and your relationship with your child. No more trial by error parenting. Just evidence based parenting tools and strategies that are both kind and firm that really work. If you show up and commit to this course, I will support you as much as I can in your efforts to reach your goals. It won't happen overnight, but I will give you the tools and strategies to get there. You are responsible for the results you achieve. I make every effort to provide you with quality information, strategy and guidance to achieve these results but in the end it is up to you. + How do I join this amazing course? Sign up above to reserve your spot in class. You'll get an email with all the instructions on how to start right away and get a link that will take you right back to your course at any time. to start building your way to parenting with greater confidence now! Copyright © 2016 Melissa Benaroya, LICSW. All Rights Reserved.